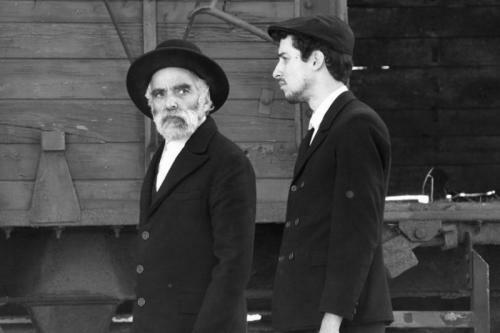 Two orthodox Jews – father and son arrive, by train, to a village in Hungary in August 1945. They are bringing with them some pitiful remains of their family – children's shoes, toys and books, all that's left to them - to bury in the village cemetery. However, we don't know, until very late on in story, what they are bringing or why. Neither do the villagers, and so they fall back on fear, guilt and prejudice to assume that they are coming to reclaim what was taken from the Jews of the village when they were handed over to the Nazis, or for some other sort off revenge. This not-knowing and the near hysteria it provokes is the central theme of the story and it creates a powerful tension that enables us to get a sense of the wrongdoings of the villagers and their differing responses to the situation in which they find themselves. The sense that something terrible is about to happen is aided by a wonderful sound track and the almost total silence of the two Jewish men who are utterly focussed on what it is they have come to do. To add to this, the action takes place on the very day of an important local wedding. Emotions are already heightened, secrets already being spilled. And terrible things do happen but only indirectly because of the two strangers - who leave the village as quietly as they arrived as soon as they have completed the burial ceremony. The villagers are sitting on a powder keg of guilt, remorse and secrets and on this particular day their world has no option but to implode. 1945 is directed by Ferenc Torok. It is beautifully shot in black and white, has some stunning performances and is a simple moral tale told without ambiguity. It is a holocaust story but it's not only that. It is a story for everyone at any point in our history about greed, lack of humanity and vicious cultural tribalism. An excellent film chosen for screening by Film Club members.